This website is operated by WILMINGTON-CLINTON COUNTY CHAMBER OF COMMERCE. Throughout the site, the terms “we”, “us” and “our” refer to WILMINGTON-CLINTON COUNTY CHAMBER OF COMMERCE. 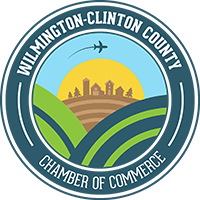 WILMINGTON-CLINTON COUNTY CHAMBER OF COMMERCE offers this website, including all information, tools, and services available from this site to you, the user, conditioned upon your acceptance of all terms, conditions, policies and notices stated here. Service Fees: Any bank service fees incurred by WILMINGTON-CLINTON COUNTY CHAMBER OF COMMERCE due to non-sufficient funds on the part of the Payee will be the responsibility of the Payee to keep their account in good standing with WILMINGTON-CLINTON COUNTY CHAMBER OF COMMERCE. A 10% surcharge will be added to any bank service fee. Late payments past 90 days will be sent to Collections and the Payee will assume responsibility for payment. Late payment/ Non- Payment may terminate the relationship with WILMINGTON-CLINTON COUNTY CHAMBER OF COMMERCE and render void all agreements in work contracts. Certain products or services may be available exclusively online through the website. These products or services may have limited quantities and are subject to return or exchange only according to our Return Policy. We have made every effort to display as accurately as possible the colors and images of our products that appear at the store. We cannot guarantee that your computer monitor’s display of any color will be accurate. We reserve the right but are not obligated, to limit the sales of our products or Services to any person, geographic region or jurisdiction. We may exercise this right on a case-by-case basis. We reserve the right to limit the quantities of any products or services that we offer. All descriptions of products or product pricing are subject to change at any time without notice, at the sole discretion of us. We reserve the right to discontinue any product at any time. Any offer for any product or service made on this site is void where prohibited. We do not warrant that the quality of any products, services, information, or other material purchased or obtained by you will meet your expectations, or that any errors in the Service will be corrected. You acknowledge and agree that we provide access to such tools ”as is” and “as available” without any warranties, representations or conditions of any kind and without any endorsement. We shall have no liability whatsoever arising from or relating to your use of optional third-party tools. Any use by you of optional tools offered through the site is entirely at your own risk and discretion, and you should ensure that you are familiar with and approve of the terms on which tools are provided by the relevant third-party provider(s). We may receive compensation for Affiliate links included on this website, although no cost is added to the consumer. All content included as part of the Service, such as text, graphics, logos, images, as well as the compilation thereof, and any software used on the Site, is the property of WILMINGTON-CLINTON COUNTY CHAMBER OF COMMERCE or its suppliers and protected by copyright and other laws that protect intellectual property and proprietary rights. You agree to observe and abide by all copyright and other proprietary notices, legends or other restrictions contained in any such content and will not make any changes thereto. You will not modify, publish, transmit, reverse engineer, participate in the transfer or sale, create derivative works, or in any way exploit any of the content, in whole or in part, found on the Site. WILMINGTON-CLINTON COUNTY CHAMBER OF COMMERCE content is not for resale. Your use of the Site does not entitle you to make any unauthorized use of any protected content, and in particular, you will not delete or alter any proprietary rights or attribution notices in any content. You will use protected content solely for your personal use and will make no other use of the content without the express written permission of WILMINGTON-CLINTON COUNTY CHAMBER OF COMMERCE and the copyright owner. You agree that you do not acquire any ownership rights in any protected content. We do not grant you any licenses, express or implied, to the intellectual property of WILMINGTON-CLINTON COUNTY CHAMBER OF COMMERCE or our licensors except as expressly authorized by these Terms. In no case shall WILMINGTON-CLINTON COUNTY CHAMBER OF COMMERCE, our directors, officers, employees, affiliates, agents, contractors, interns, suppliers, service providers or licensors be liable for any injury, loss, claim, or any direct, indirect, incidental, punitive, special, or consequential damages of any kind, including, without limitation lost profits, lost revenue, lost savings, loss of data, replacement costs, or any similar damages, whether based in contract, tort (including negligence), strict liability or otherwise, arising from your use of any of the service or any products procured using the service, or for any other claim related in any way to your use of the service or any product, including, but not limited to, any errors or omissions in any content, or any loss or damage of any kind incurred as a result of the use of the service or any content (or product) posted, transmitted, or otherwise made available via the service, even if advised of their possibility. Because some states or jurisdictions do not allow the exclusion or the limitation of liability for consequential or incidental damages, in such states or jurisdictions, our liability shall be limited to the maximum extent permitted by law. You agree to indemnify, defend and hold harmless WILMINGTON-CLINTON COUNTY CHAMBER OF COMMERCE and our parent, subsidiaries, affiliates, partners, officers, directors, agents, contractors, licensors, service providers, subcontractors, suppliers, interns and employees, harmless from any claim or demand, including reasonable attorneys’ fees, made by any third-party due to or arising out of your breach of these Terms of Service or the documents they incorporate by reference or your violation of any law or the rights of a third-party. These Terms of Service and any separate agreements whereby we provide you Services shall be governed by and construed in accordance with the laws of 100 West WILMINGTON-CLINTON COUNTY CHAMBER OF COMMERCE Ohio US 45177. Questions about the Terms of Service should be sent to us at INFO@WILMINGTON-CLINTON COUNTY CHAMBER OF COMMERCE.com.